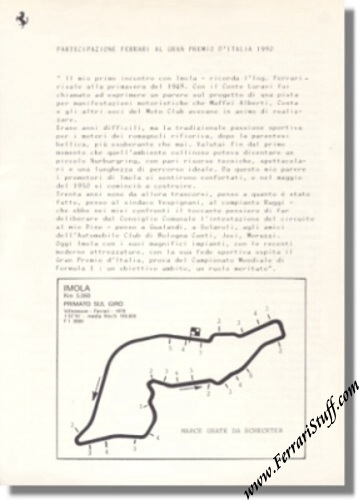 Vintage 1980 Ferrari press release on the Grand Prix of Italy held at Imola. Mentions that Gilles Villeneuve and Jody Scheckter will be driving the Ferrari 312 T5 as well as the spare car being a 312T5 and the experimental car was a 126 C.
Contains quotes by Enzo Ferrari, Mauro Forghieri, Marco Piccinini, Jody Scheckter and Gilles Villeneuve and a section on the "Sporting Point". Also shows a map of the Imola track with the gear shifting points of Scheckter. Gilles Villeneuve would get a puncture in lap 4 which ended his race. Jody Scheckter finished the race in 5th position, 1 lap behind winner Nelson Piquet.